The Capping Removal tool is a simple multi-function tool that not only assists in quick and easy removal of capping form the sideform but also is a scraper. It can be used to clean concrete spillage from the capping and sideform, clean the ball lock and channel rails at the rear of the sideform and also assist in stripping the sideform away from the cast concrete member. One simple tool with 4 functions. SRB developed an End Seal that fits into the ends of Spartan Sideform sections and serves a number of purposes and functions. Safety: According to Occupational Health and Safety data records in Australia the majority of injuries in a precast yard arise from the use and handling of sideforms / edgeforms. The rubber End Seals cover the sharp edges of the sideform to minimise possible injuries attained from human impact with the edge of the sideform. The Splayed End Seal is designed to replicate the internal fillet chamfers of the sideform. This eliminates the need to cut any splays on the edge of the sideform where the sideforms perpendicularly abut because the Splay End Seal forms the chamfers at the end of the sideform. Removing the need to cut sideform edge chamfers prevents all possible injuries from that process. The rubber Square End and Chamfer End Seals are colour coded in red and yellow safety colours to make them more visible and easier to avoid in the dark precast environment. Concrete Fill: The rubber End Seals prevent or minimise concrete bleed into the sideform. Concrete bleed in the sideform creates issues in abutment of sideforms and cutting of sideform as the concrete damages cutting blades. The Ends Seals prevent this from happening. The End Seals are designed with a minimal contact point at the front (form) face of the sideform / edgeform and play out towards the rear of the sideform. This inhibits the sideform lengths from jarring into one another during the process of stripping the forms away from the cast concrete which translates into production and cost efficiency as well as less damage to equipment. In the process of forming precast panels and structures it is almost unavoidable to have to cut sideform sections and lengths to make up specific lengths of edgeform on a mould or internal opening and penetrations. This results in damage to sideforms and hence costly waste. The Spartan Sideform is designed to be very easily and cost-effectively permanently joined so that smaller pieces can be joined to make up longer lengths again without effecting the operational capabilities or quality of finish of the sideform. This drastically reduces long-term costs and operational material waste and makes the SRB Sideforms / Edgeforms one of the most cost effective alternatives available. The Spartan Sideform has internal rib guides that suit standard stainless steel square hollow section. The stainless steel sleeves are inserted into the ribbed guides in one end of the Spartan Sideform, leaving a section (around 100 mm or more) protruding from the end. 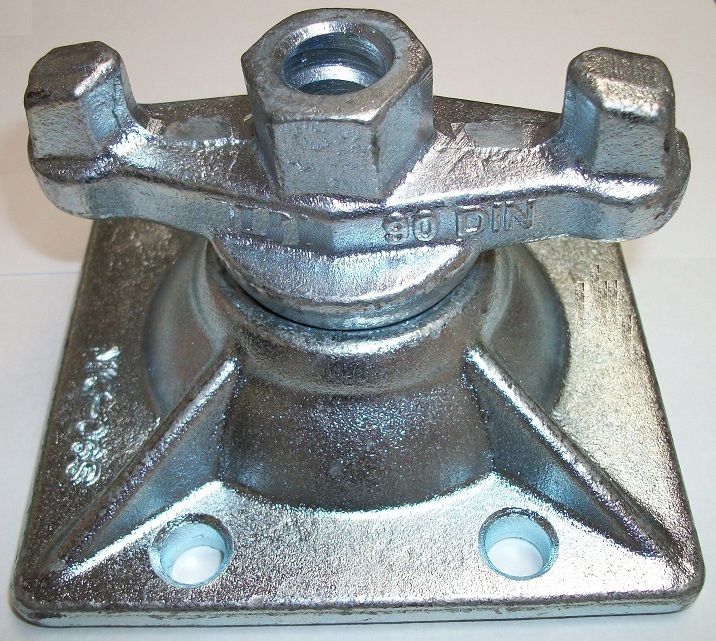 The sleeves are then either pop riveted or screwed into position in the specific purpose grooves at the rear of the sideform (designed to accommodate the screw or pop rivet head). The sideform length to be joined is then aligned with the protruding stainless steel sleeves and the two sections of sideform pushed together to fully abut. The internal sideform ribs ensure that the two lengths of sideform perfectly align in both planes. Once abutted, pop rivets or screws are once again used to secure the fitted / joined piece. During the production process it is necessary to temporarily join two lengths of sideform / edgeform to produce the required length of the panel or structure being cast. This however is not a permanent join particularly when excessively long sideform lengths are required and permanently joining the sideforms would thus make them too heavy and impractical to handle. SRB utilises Steel Connector Plates in purpose built channels at the rear of the sideforms to simply, quickly and very cost effectively join lengths of sideform for the duration of the manufacture process. The connector plates are generally left / stored in one end of a standard length sideform simply by turning the knob on the connector plate to lock it in the sideform channel. The two sideform lengths being joined are abutted end to end and the connector plate is simply released and pushed into the channel of the sideforms being joined so that the plate is engaged in both sideforms. The knobs are then easily hand tightened securing the two sideforms to one another for the length of the the production process. Once the concrete is sufficiently cured for stripping the connector plate is loosened and pushed fully into one sideform and again locked to remain in that sideform. This disconnects the two joined sideforms enabling them to be separately stripped away from the cast member. The Spartan Internal Corner Units are pre-fabricated 90 degree internal corners for use in forming window, door and other openings or penetrations in the mould, as well as internal corners in the perimeter mould edgeforms. The Internal Corner Units allow for both top capping and base insert profiles to be changed to match the sideforms being used. The Internal Corners simply attach to the standard sideform ends via use of the joiner plate in the rear sideform rail. The joiner plate perfectly aligns the corner unit with the sideform end resulting in true and square internal corners and eliminating human and material errors associated with traditional forming methods. The Spartan Sideform is designed for simple connection to magnet clamps via an adaptor plate that is affixed to the magnet clamp along a rail strip at the rear of the sideform. Therefore the connection simply involves lowering the adaptor attached to the magnet clamp so that the ball lock at the base of the adaptor plate fits into the corresponding ball lock rail strip at the rear of the sideform. Once the adaptor plate is in the rail strip along rear of the sideform, the sideform is adjusted into final position with the clamp attached. The handle on the magnet clamp is then pushed down to engage the magnetic plate to the steel table and secure the sideform in position. The system does not require any bolts, screws or any other fixings to secure the sideform to the magnetic clamp. The rubber-like Base Insert in the Spartan Sideform forms the base chamfer in the sideform / edgeform profile. This allows you to have any edge chamfer profile in the edgeform base simply by inserting the new profile into the sideform. The insertable Base Insert is designed to take up any minor variances between the edgeform and the casting bed / table surface which minimises concrete bleed to the bottom edge chamfer of the cast concrete member (avoiding expensive patching to make good the edge). Traditional casting procedures involve the placement of silicone to the interface between the base of the edgeform and casting table which is very labour intensive and hence costly in both installation of the silicone and removal of same from the casting table and edgeform. Therefore by eliminating this process, the Base Insert substantially increases productivity and production cost-efficiency. The range of insertable base chamfer profiles will increase in the future and custom profiles can be made to order relatively cost efficiently. It is substantially more cost-effective to extrude an insertable base chamfer profile to a specific shape and insert into existing aluminium extrusion blanks than to manufacture and stock an entire new range of edgeforms. The current range of insertable inserts is 12 mm x 122 mm Chamfer profile and Square Edge profile. The Spartan and Centurion Sideform Capping are made from a durable PVC Polymer and come in lengths of 5.8 m.
The capping snaps onto the sideform / edgeform to form the chamfer profile and create the sideform overall height. The range of chamfer profiles will increase into the future. Custom profiles and heights can be made to order relatively cost-efficiently. It is substantially more cost-effective to extrude a PVC profile to a specific height and chamfer edge profile to snap on to existing aluminium extrusion blanks than to manufacture and stock an entire new range of edgeforms. The current profiles include: 12 mm x 12 mm Chamfer Edge in 00 (gives standard sideform height to aluminium extrusions), + 5 mm, + 10 mm, + 15 mm, + 20 mm & + 25 mm height increments. Square Edge Profile (no chamfer) in 00, + 5 mm, + 10 mm, + 15 mm, + 20 mm & + 25 mm height increments. The Spartan Sideform is made from high structural grade alumnium extrusion with high dimensional tolerance and accuracy. The sideforms come in standard lengths of 5.8 m and heights of 55 mm, 100 mm, 125 mm, 150 mm, 175 mm, 200 mm. The extrusions are epoxy powder coated with colour-coding for sideform height.